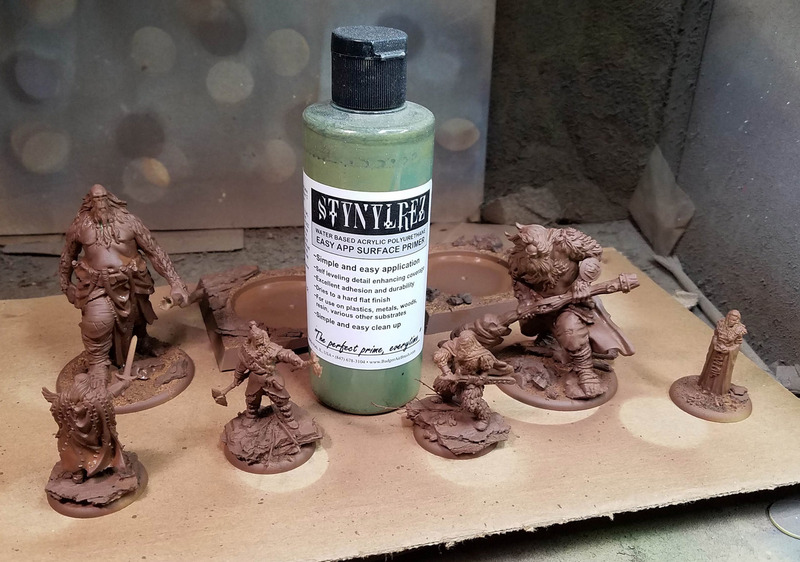 I have been using the Badger Stynlrez primer for many years now, since it works on every surface… metal, resin, plastic, etc., with no problems at all! I used to brush in on before I had an airbrush, and that worked fine as well. 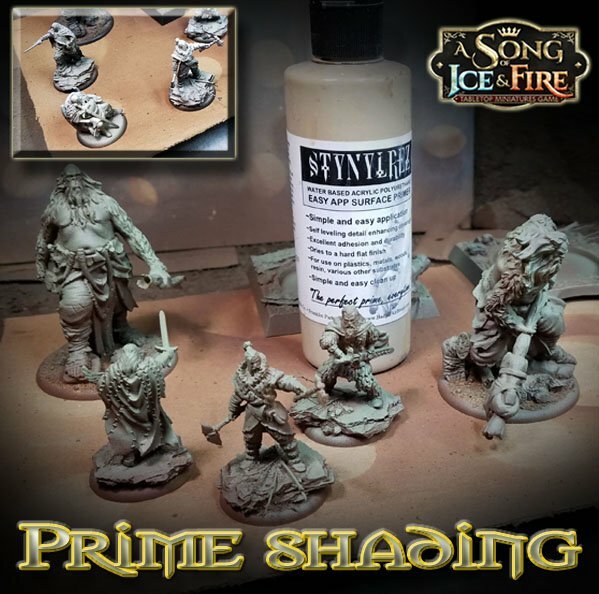 Now that there are over a dozen different colors of the Stynlrez primer, you can do what I like to call “Primer Painting”. 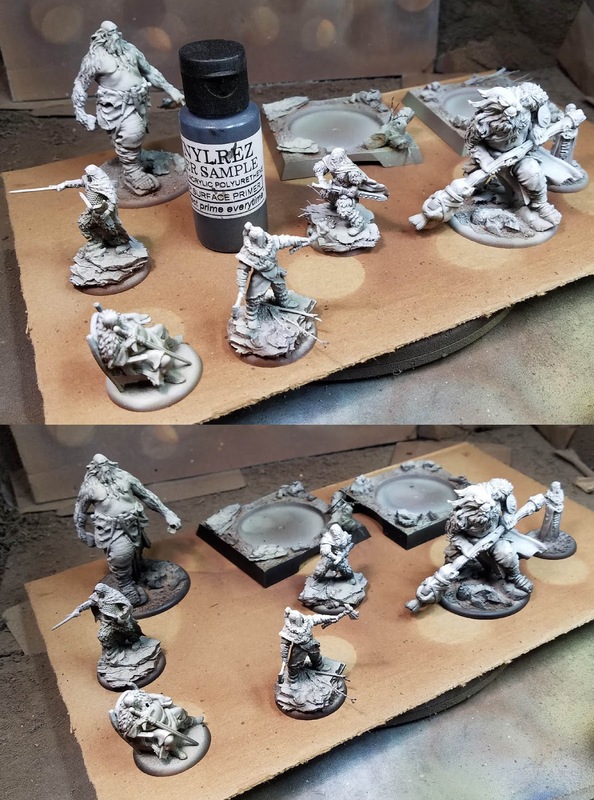 I’m sure you have seen people do some pre shading of their figures with combinations of black and white primer… but there is even more that you can do with the Stynlrez. I usually start off with one of the brownish colors. This one is more of a raw umber color, with a touch of red. There is also an ebony color which is a little darker and more muted. That is not a bad one to start off with either. 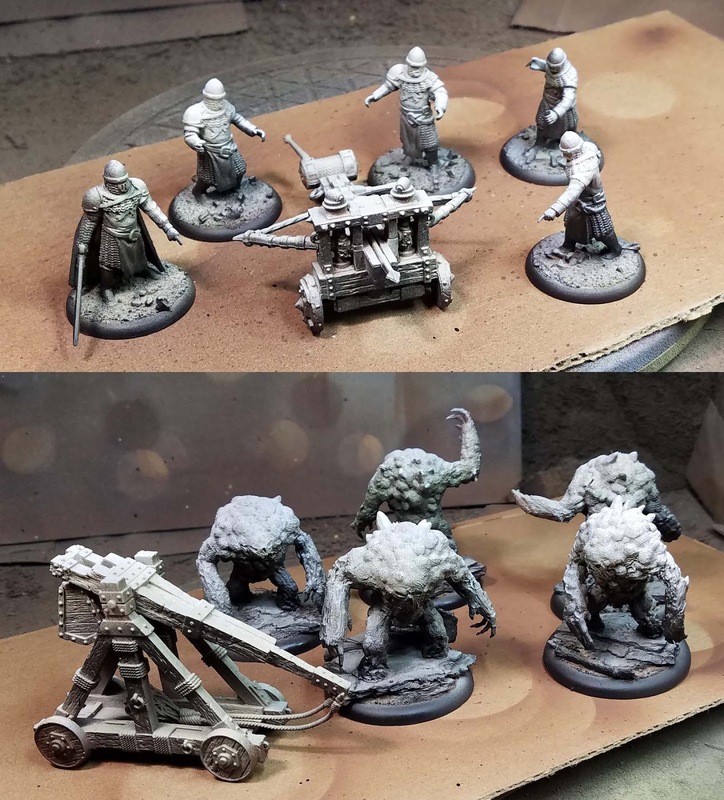 There are some Mierce Miniatures bog monsters in this image. I am not necessarily trying to cover the entire miniature with this layer. Most of the focus is on the lower two thirds of the figure. 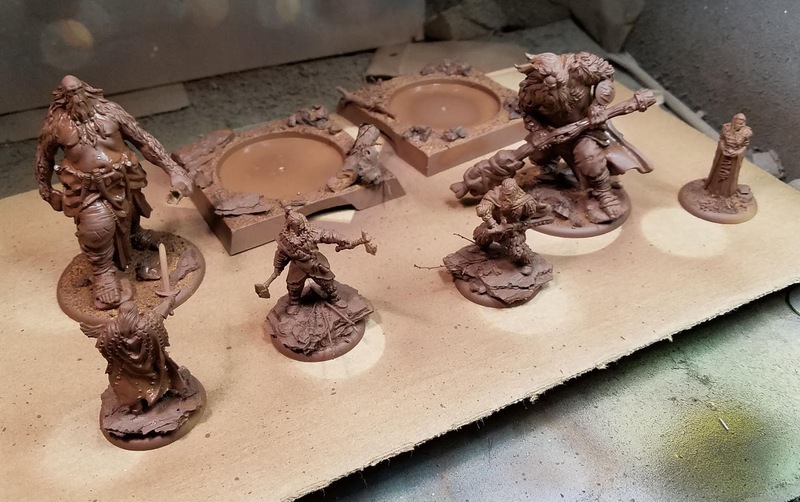 Now it is time to get some extra colors into our primer painting. 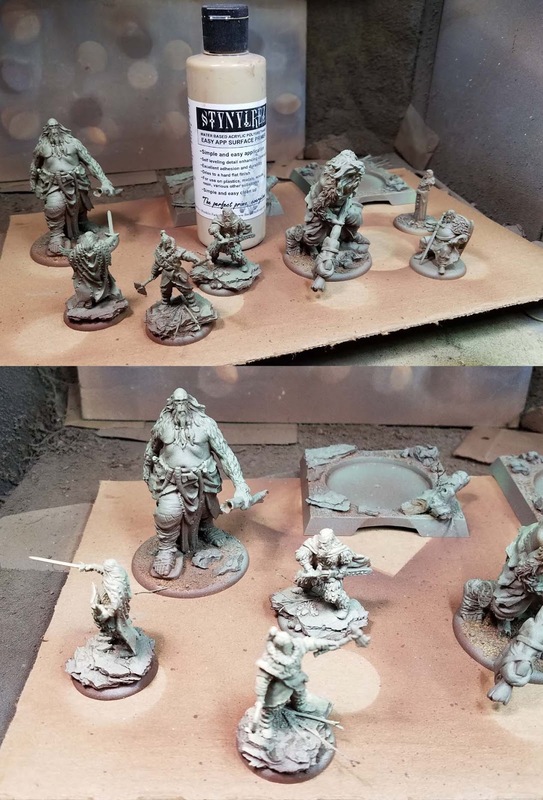 By spraying this lighter green over the reddish brown, I am already getting some interesting colors on the skin tones and cloth of these Free Folk characters and Savage Giants. The key is not to wipe out the underlying layers of reddish brown, but to dust the green over the top. This creates a blend of colors, which makes a fantastic under painting for later on! 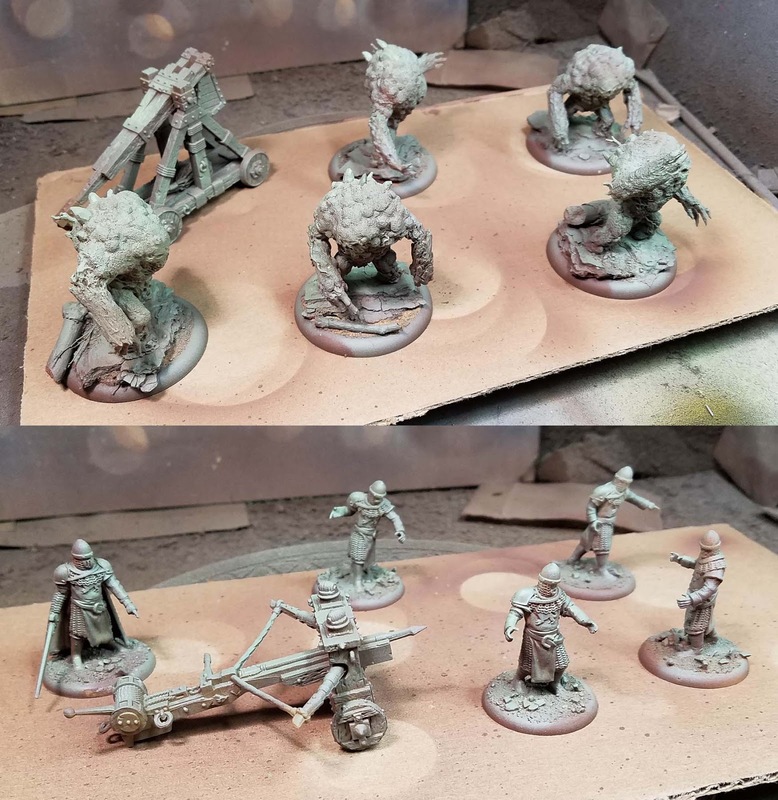 I did the same with the Bog Monsters and some converted Starks from Song of Ice and Fire. 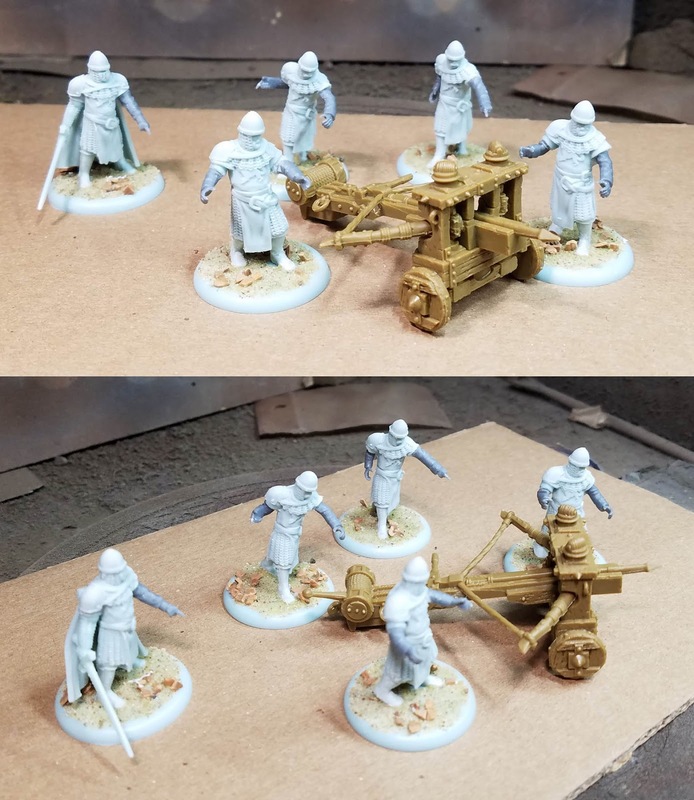 I actually used Bolt Action winter Soviet arms to replace the swords and shields. 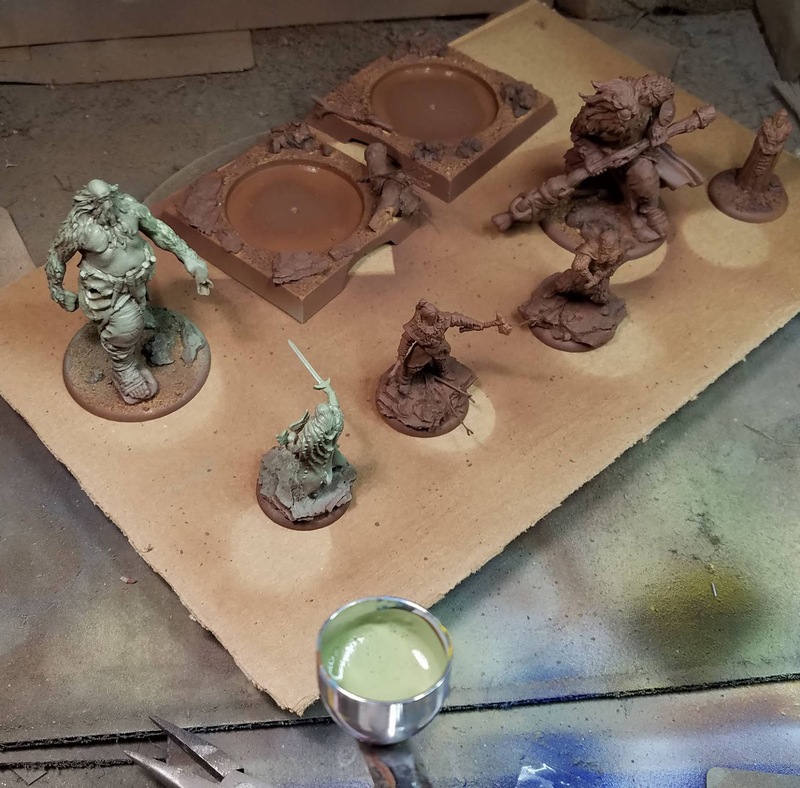 Next, I will do an even lighter dusting of this sandy yellow primer, which will lighten the greenish tones a little, and create yet another layer of mixed colors that I can play off of while painting. 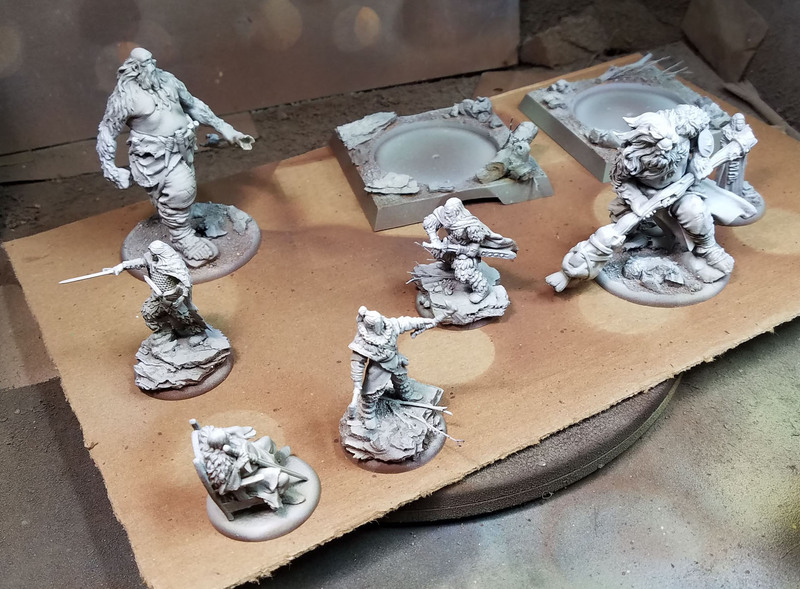 Since my first several layers of paint tend to be glazes, I usually make my last layer of primer be a gentle spray of white. This creates a full value scale, and it means that my glazes won’t darken the figure too much. Here we have that nice value pattern from light to dark, set up in a matter of minutes. 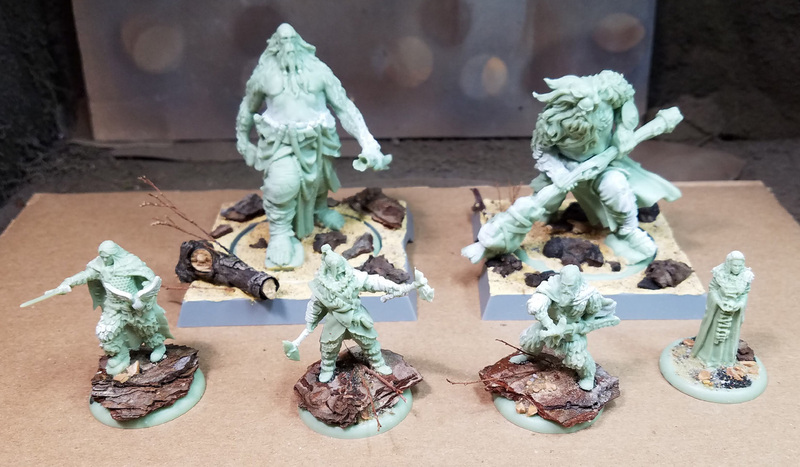 When I prime miniatures, I normally do several dozen at once. This means prepping and basing a lot of figures, but it really does maximize your work time, and make the process more efficient. 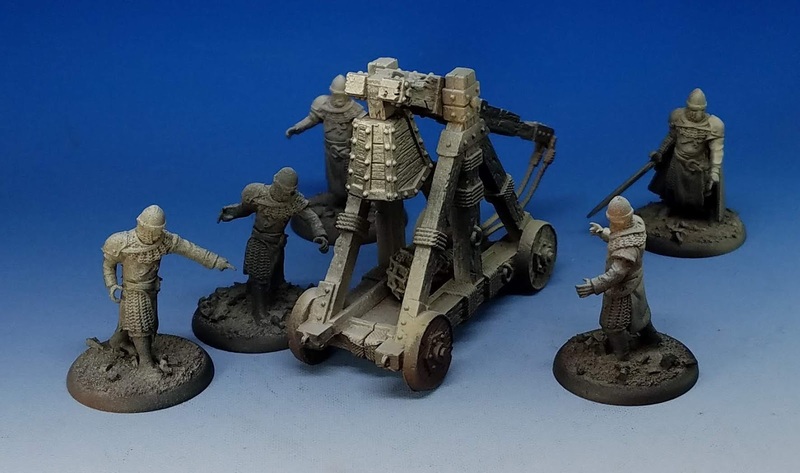 On figures that have a very visible base (or movement trays in the case of SoIaF miniatures), I go over the lower third of the figures with that dark ebony color or even a black. If you compare the two images, you can really see the difference that it makes! 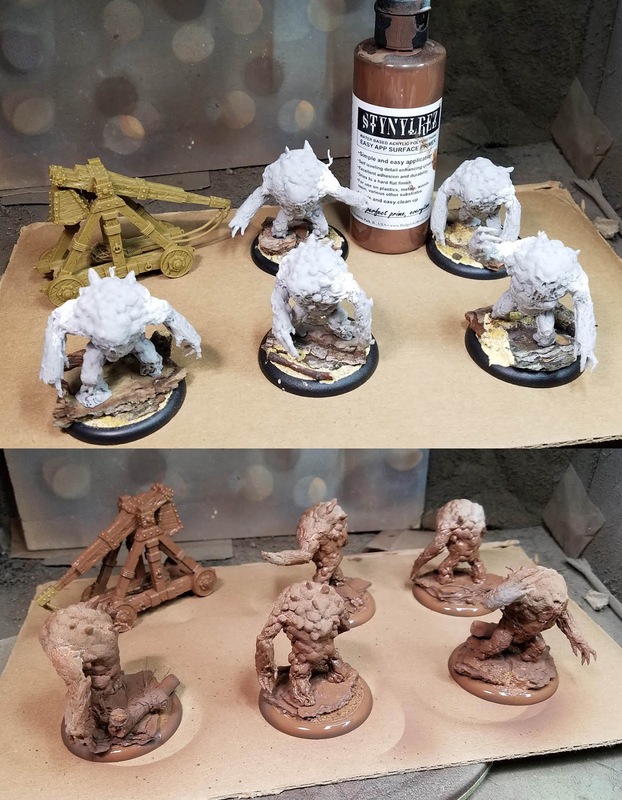 I did the same with my converted Stark weapon crew and the Bog Monsters. 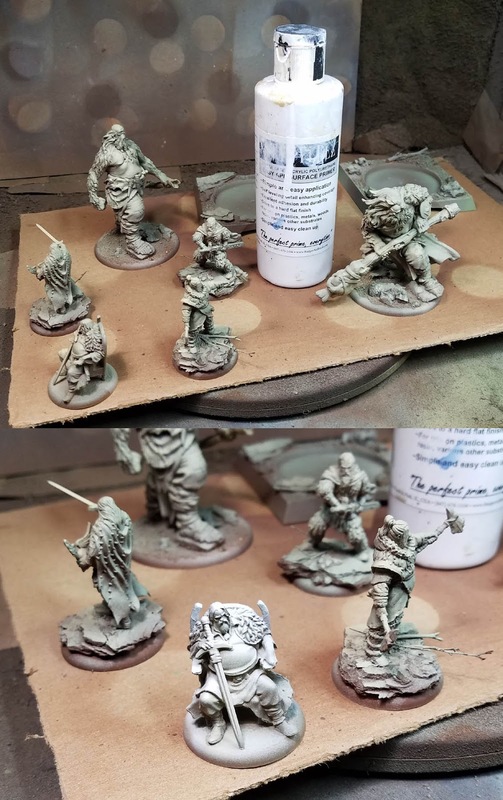 As I mentioned before, this kind of pre shading sets up my subsequent glazes quite well, I will still add more highlights and middle tones, but the framework is already in place. Sometimes you notice things in terms of shapes when you do the pre shading that you might not have noticed while prepping the figures. 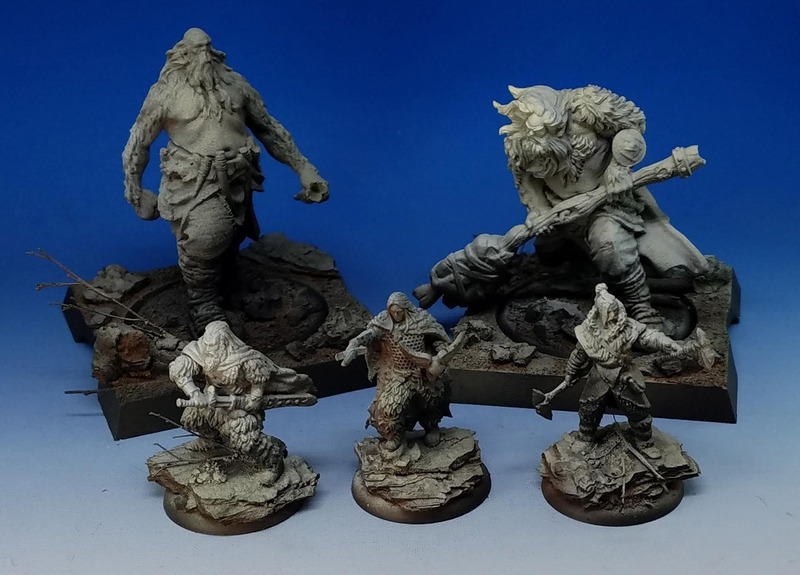 « Metalhead Minis: Unboxing And Demo- Abteilung 502 Fantasy And Metallics Pigments!